An artistic experience like no other. The mission of the Philadelphia Chamber Music Society—founded by Anthony P. Checchia in 1986—is to engage our community in a life more beautiful through the shared experience and transformative impact of chamber music. Lock in our best prices, guarantee yourself the best seats, and get priority access to ticket exchanges and special offers. The Philadelphia Chamber Music Society has taken the lead as the city's constant reminder that it's all about artists and repertoire. In fact, without a single concession, the scale and quality of the series is unlike anything else in the country. We aspire to be a “Society” in the best sense of the word—a group of people who love great music and believe that it should be accessible to everyone. Whether it's your 1st or 100th concert, you are welcome here. Find out what we're all about and how to make the most of your experience. 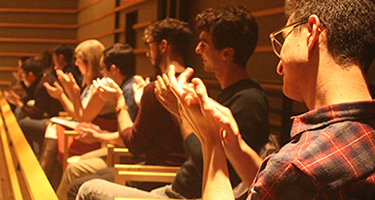 Your tax-deductible support enables us to sustain artistic excellence, affordable ticket pricing, and our many education programs that inspire students.